We don’t mind saying the West has the richest cache of seafood in the country—and the best wines. But we spritz lemon on that fish, spoon vinegary mignonette on the raw oysters, batter and fry those scallops, dredge our clams through tartar sauce, and dip our shrimp in spicy cocktail concoctions. 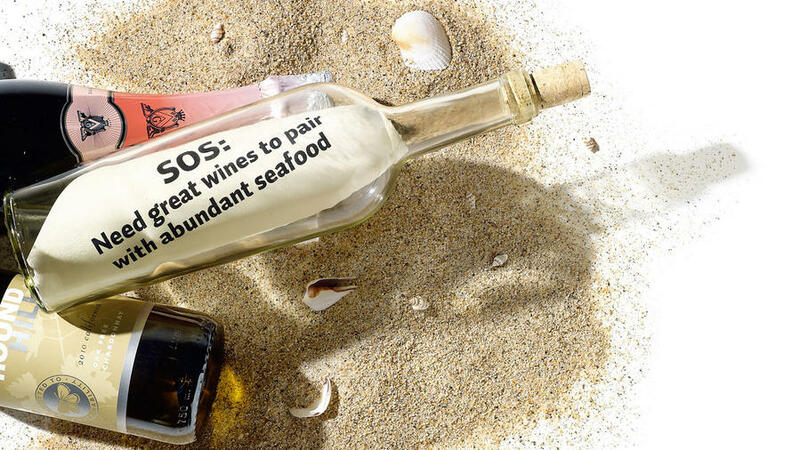 Which wines are up to the task of handling all those additions while still pulling out the best in the seafood? They might not be the ones you’d expect. Here are our five favorites, to punch your next maritime feast up a notch. With racy acidity and bubbles, sparkling clinches best all-around seafood wine. Typically made from a blend of Chardonnay and Pinot Noir, a flute of brut offers up apple, pear, and melon from the former and subtler berry and cherry from the latter. The red fruit plays up the sweet side of fish, but it’s joined by enough citrus to work like a spritz of lemon. Bonus: Those bubbles cut through the fat of fried goodies, while the wine’s yeastiness (from time on the lees) loops right into crispy batter. Our picks: Argyle 2007 Brut (Willamette Valley; $27). Crisp green apple, pear, and cherry with a hint of peach and sprinkling of fresh herbs. Domaine Carneros 2007 Brut (Carneros; $26). Pretty apple and almond blossom around pear, with underlying flintiness. We’re such fans of bubbly with seafood that two of our favorite partners are sparklers. Rosé brings all the strengths that brut does to the table. But it has a little more body and vibrant red fruit flavor from being heavy on the Pinot Noir and spending a smidgen of time on the skins. The bigger fruit, with the same great acidity, works well with tomato-based cocktail sauce, spice, and garlic. Great matches: Oysters and shrimp with tomatoey cocktail sauce and horseradish, crab and shrimp with rémoulade, garlicky steamed mussels, and spicy tuna rolls. Our picks: Gruet Brut Rosé (Rio Grande Valley; $15). Lovely wild mousse delivers a whole strawberry patch laced with lime. Scharffenberger Brut Rosé (Mendocino County; $23). Bright berries pop over creamy citrus. A combination of bright citrus, delicate minerality, and sweet fruit flavors like peach, Meyer lemon, and pink grapefruit gives Pinot Gris a tasty affinity to fish and shellfish, which are often briny and sweet at the same time. That crisp citrus cuts through fat and stands up to tangy relish, making Gris the tartar sauce queen. Great matches: Oysters—grilled, baked, or on the half-shell—and whatever you can slather tartar sauce on: grilled halibut or seabass; deep-fried shrimp, calamari, or clams; fish and chips. Our picks: Morgan 2010 R&D Franscioni Vineyard Pinot Gris (Santa Lucia Highlands; $18). Pithy stone fruit and bright green apple softened by creamy pink grapefruit. Ponzi 2010 Pinot Gris (Willamette Valley; $15). Notes of melon and Asian pear rounded off by delicate peach and an edge of minerality. Once panned here because of shoddy early versions, Riesling is getting drier and better now. It’s a rich mouthful of a white with a bracingly high level of acidity for balance. Expect sweet-seeming peach and apricot flavors along with green apple and a note of minerality hinting at diesel fuel (a good thing) that echoes the brininess of the sea. The wine’s lanolin texture has a special affinity for dense shellfish, and its sweet fruit is happy with spice. Great matches: Spicy Asian scallops, shrimp, mussels, and crab (think ginger and Thai chiles in mussels, for instance, or lemongrass and cracked crab); sushi of all stripes. Our picks: Anam Cara 2009 Nicholas Estate Riesling (Chehalem Mountains; $19). Honeysuckle and green apples give way to fuzzy peach and almond blossom. Breggo 2009 Riesling (Anderson Valley; $25). Exuberant florals backdrop crisp green apple and white peach. For cracked crab and drawn butter, traditional oaky, buttery California Chardonnay is brilliant. But that’s about all she wrote for good matches. Lose or reduce the oak, as many makers are doing, and you have a sip that’s still rich with the apple, pear, melon, and citrus flavors that seafood loves, but is crisp and vibrant, standing up to the acidity we spritz on our fish. Great matches: Crab—cracked or in cakes, with lemony aioli; fried scallops, shrimp, calamari, and fish and chips; rich black cod with just a squeeze of lemon. Our picks: Foxglove 2009 Chardonnay by Varner (Central Coast; $15). Briny, blossomy nose followed by long, gentle lemon, golden apple, and Asian pear. Round Hill 2010 Oak Free Chardonnay (California; $8). A mouthful of pure, crisp Chard fruit—freshly squeezed apple and pear.